Prepare one bag of frozen cheese ravioli according to package directions. Add 2-3 cups of fresh broccoli florets three minutes before the end of cooking time. In separate skillet, simmer 2 cans of diced tomatoes for five minutes. Once heated and some liquid has evaporated, stir in 8 ounces jalapeno cream cheese until fully melted. 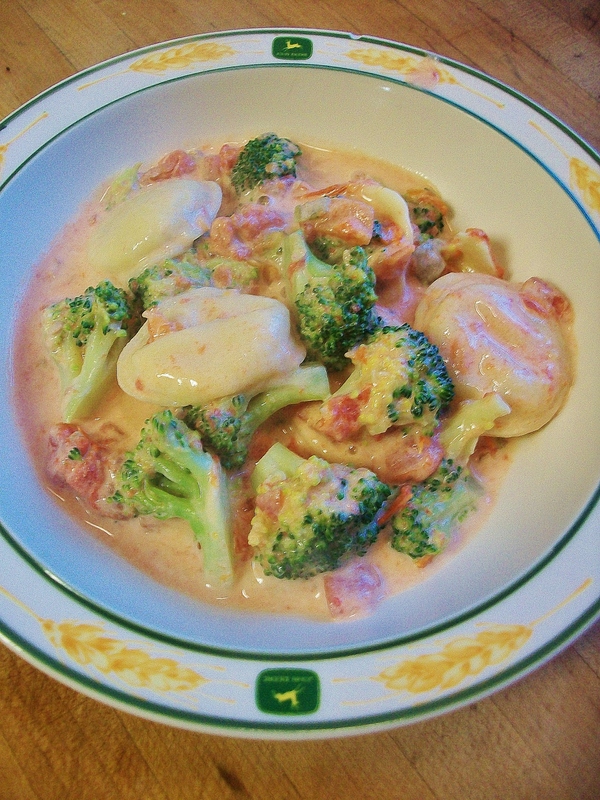 Drain ravioli/broccoli and combine with tomato sauce. If you aren’t into spicy, stir in regular cream cheese and your own favorite seasonings. You could also experiment with various sorts of tomatoes–Italian, fire roasted, etc. This came together in well under half an hour, and all diners were pleased! Posted in CasseroleTagged broccoli, cheese, cream cheese, creamy, Easy, fast, inexpensive, ravioli, recipe, semi-homemade, spicy, tomato, weeknightBookmark the permalink.